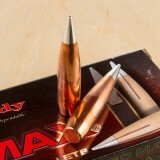 Hornady's A-MAX line is the result of more than 50 years of studying bullet performance. 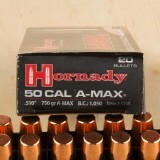 Each projectile in this box of 20 is .510" in diameter and weighs 750 grains. These bullets are engineered to provide match and competition shooters with the highest level of consistency and reliability. These projectiles feature a low drag tip and a secant ogive profile to raise the ballistic coeffieient and increase in-flight stability. 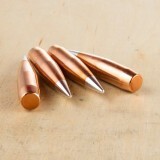 Each bullet has a swaged lead core that is wrapped in Hornaday's AMP copper jacket. The results are a bullet that is extremely uniform and has near zero wall thickness variation. 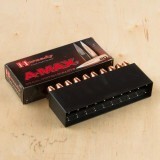 My three 50's shoot these A-maxes very consistently at 1000 yd matches. Wideners has always been a good source of 50 BMG components and they run sales on these products as well. I am a long time Wideners customer. They offer good products at good prices. They are my go to place for reloading everything.